Rubbing Finger Nails to reduce grey hair: Rubbing left and right hand nails with each other is a powerful way to cure hair fall and increase hair growth. It is extremely simple yet very effective. 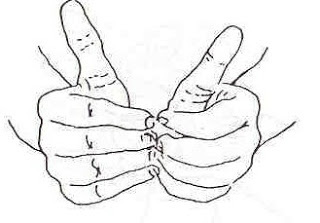 Fold both your palms inwards and place the fingernails of both hands against each other. Then with regular swift motions, rub them against each other. It is simple and can be done anywhere anytime. Do it for about 5-7 minutes twice a day.You need not devote special time; just do this while watching a film or commuting to work. The nerve endings just under your fingernails are directly connected to your hair roots. By rubbing your nails together,you help boost blood circulation in your scalp. This rubbing procedure increases the blood flow to the scalp and helps in strengthening the roots, which in trun reduces grey hair. It not only helps in curbing hair loss, but also leads to regrowth of lost hair in people suffering from baldness or receding hairlines. And if that is not good enough, it also brings back the color naturally thus getting rid of the problem of graying. It is tried and tested and will definitely show results. You need to be patient though. You will begin to notice a difference in about a month and by the end of 6 months you would probably be successful in ridding yourself of all your hair problems. When you get up in the morning, rub the area of your forehead closest to your hairline. This helps in removing any blocks in circulation in your scalp. Rub lightly for a few minutes. That’s all it takes! Don't do it on problematic skin/nails or if there are infected sores or lesions on the hands, or on brittle/diseased nails.